If you are craving a meaty fish steak but are tired of eating tuna or salmon, kingfish is a good alternative. Kingfish are ocean fish that are related to the Spanish mackerel. In the United States, kingfish are fished off the coasts of California and in the Gulf of Mexico. Like other large, slightly oily fish, kingfish can be grilled, broiled or poached with satisfying results. The thick steaks stand up well to high heat as well as simmering. Preheat the grill to medium-high, or 400 degrees Fahrenheit. Brush olive oil on the grill grates to prevent the kingfish from sticking. Brush the kingfish with the rest of the olive oil and season the steaks with salt and pepper to taste. Place the kingfish steaks on the grill and cook them for eight minutes on each side, or until the kingfish is cooked all the way through. Take the kingfish fillets off the grill and allow them to rest five minutes before you serve them. The resting time allows the kingfish fillets to reabsorb some of the hot juices, which will make the kingfish fillets more juicy as well as prevent them from falling apart when you serve them. Preheat the broiler. Brush the broiler pan with olive oil to prevent the kingfish from sticking. Baste the kingfish steaks with olive oil and sprinkle them with salt and pepper to taste. Place the kingfish steaks on the broiler pan and put the pan in the oven. Broil the kingfish steaks for five minutes per side, or until the fish is cooked through. Take the kingfish out of the oven and sprinkle parsley and paprika on the steaks. Allow them to rest for five minutes, then serve warm. Pour 2 tbsp. olive oil into a heavy skillet and heat over high heat. Add the onion and garlic and sauté until the garlic begins to pop in the pan. Reduce the heat to medium and add the carrots and celery. Sauté for two minutes. Add the white wine and the peppercorns and simmer for two minutes to integrate the flavors. Add the kingfish steaks and simmer them for 15 minutes, turning them once during the cooking time. The steaks are ready when they are opaque all the way through. Take the kingfish steaks out of the pan and discard the poaching liquid. Serve the steaks hot. Use a meat thermometer to test the internal temperature before consuming. 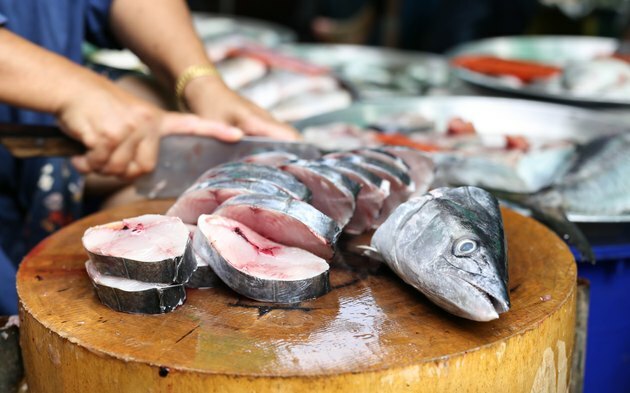 To avoid food-related illness, FoodSafety.gov recommends consuming fish and seafood until it reaches at least 145 degrees F.
Like tuna, many people prefer to eat kingfish less than well cooked. Unless the kingfish is sushi-grade, do not eat undercooked kingfish. Raw kingfish may contain harmful bacteria that can cause food poisoning.